With more than 100 partners, EuroBonus membership makes your life easier. 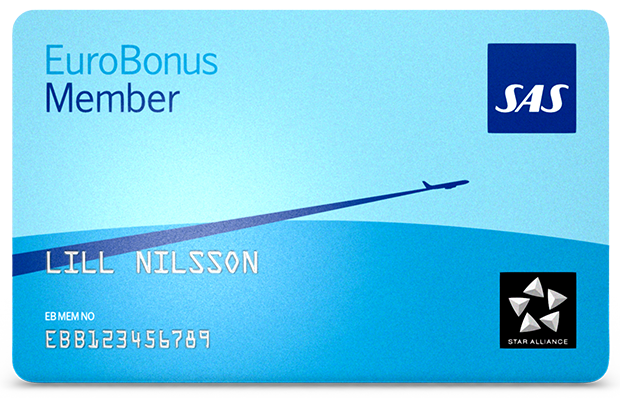 EuroBonus is SAS’s loyalty program. The more you fly with us or use our partners, the more you earn points, and once you have enough of them you can exchange them: for example, for a trip with SAS, Star Alliance or other partners. You start to get benefits as soon as you become a member. Once you hit the targets during your 12-month qualification period, you'll be automatically upgraded to a higher level. Getting to the Silver level has never been easier: it takes just ten flights with SAS and Widerøe within a 12-month period – or 20,000 Basic points – for you to get to enjoy extra baggage and Business check-in benefits. Gold members can give away a Silver membership, while members of Diamond – SAS EuroBonus’s new top-tier membership level – can give away a Gold membership. You can pay for your flights using a combination of points and cash, and if you combine your EuroBonus Card with a Diners Club or MasterCard credit card (or American Express in Sweden and Norway), you can earn points on all your purchases, including grocery shopping or getting gas for your car. You earn points on almost anything in your daily life and they can be converted to flight tickets, upgrades onboard, bonus nights at nice hotels, car rental, free phone calls, and much more. So when you use your card to pay for a restaurant bill or a day’s fun at the amusement park, don’t cringe – smile: you are one step closer to your next dream holiday – and all the nice benefits that are attached to each card. So, start saving points, and before you know it, you’ll be ready take the first step on your journey of a thousand miles.